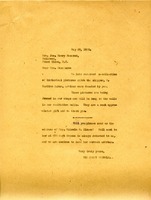 The Berry Schools writes to Mrs. Hammond to thank her for the historical pictures. They will be framed in the school shops and hung on the walls of the recitation halls. 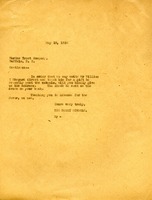 Stella Balding writes to Martha Berry to ensure that she has the correct address with which to send a proper donation to Berry. Martha Berry received a check from an H. E. Fortin and wishes to have his address to acknowledge the gift from him. The reply from the bank in South Orange, NJ, is also contained in this document; they supply the corrected name: T. E. Fenton. The gentleman of the Pelham Trust Company send Mrs. Marie D. Grant's address in response to Miss Berry's letter.